We support minorities. Workshop for young people using films about an unfair relationship between majority and minority. It analyses the causes and effects of stereotypes and prejudices, and helps to prepare the reaction. Short films „Think about it” („Przemyśl to”) (https://vimeo.com/207037171, hasło: polskalab_2) and „Anonymous” (“Anonim”) (https://vimeo.com/207008747, hasło: polskalab_1) treat about relations between Poles and the Ukrainian minority. 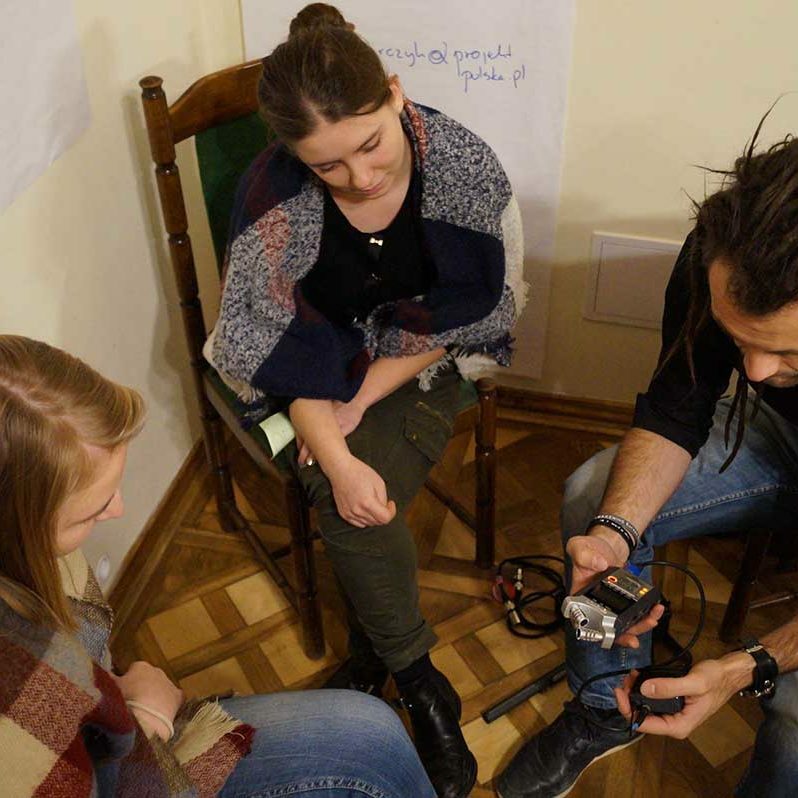 The films were created by young people from Przemysl – both people from the Ukrainian minority and a Pole – based on their experiences and reflections. Movies encourage discussion about stereotypes, prejudices and their consequences for the community. They are worth analysing in order to become attentive to other people living next to us, not to exclude them, but to get to know them, and act together for the common good. What might have caused them? Where do you like to hang out, meet with your friends, read books (a place in a park or by the river, square or backyard, coffee hours or club)? How would you feel if you had to leave and you could never come back to your favourite place? After 5-10 minutes ask the groups answering one question first, then the second one, about the outcome of their discussion. If necessary, ask about the feelings associated with hearing stereotypes about them and the lack of possibility to return to their favourite place. Write the feelings on the flipchart, dividing them into two groups. Ask what participants in the class would do in such situations – would they protest, report to someone, seek support, try to return back home? Say they are about to see two short videos of similar relationships between people. Ask participants to look for similarities and try to get into the situations of movie heroes. How would they feel? Ask what negative situations happened to the protagonists of the film. List the situations on the flipchart. Ask what’s the role of spreading rumours that people of a given nationality have black palate? This can lead to stigmatization, dehumanization and exclusion of such individuals and groups. There are words like „ocyganić” (meaning „to cheat” – related to Roma) and „żydzić” (meaning „to skimp” – related to Jews). Such words or the placement of groups as specific heroes of stories, legends or tales can lead to the formation of prejudices towards those groups. Ask the participants to smaller groups and give them 5-10 minutes to analyse causes and effects of individual stereotypes, prejudices, and discrimination. Each group, in the centre of the A4 sheet, writes the selected situation and then on the one hand adds the suspected cause and, on the other, the consequences of the situation. During group work, make sure that people do not end up with single answer – ask what the causes and effects of each situation are – the root of the problem is usually more profound. If there are no such answers, ask about the influence of the media, politicians, information found on the Internet, knowledge of people from both groups. Finally, all groups present the results of their analyses. Summarize group presentations with information on the importance, origins, and effects of stereotypes and prejudices (see Information 1). Talk about national and ethnic minorities in Poland, the Ukrainian minority, migrants from Ukraine and the scale of speech of hatred towards them, and, if necessary, migration in general (see Information 2). Recall the feelings recorded during the first group work and the effects of situations presented in films. Ask what people can expect in such situations. What can you do to support them? If no idea raised, suggest sending supportive messages – letters or recorded videos. Thinking about working for a better understanding of the culture and the situation of minorities, you might want to consider commemorating Ukrainian places in your community, creating places where minorities will feel good, involving such people in creating materials that will bring the identity and perspective of the chosen group. Stereotypes are simplifications and generalizations of phenomena and people, created on the basis of cultural transmissions and personal experiences, often unverified, incomplete or false. When stereotypes come with emotions and attitudes, they become prejudices. They are formed during upbringing and education, by lack of or little contact with a given group, or environmental pressure. In addition, they can enhance the social, political or media atmosphere, which can exacerbate antipathy, scorn or hostility towards individuals or groups. In most cases, prejudice can be faced with knowledge based on facts, knowledge of people affected by superstitions, and communication skills. Disputes are needed but should be carried out with respect for the opponents and their values – these are democratic models. National minorities are communities that have their own country but have been living in Poland for at least 100 years. These are: Belarusian, Czech, Lithuanian, German, Armenian, Russian, Slovak, Ukrainian and Jewish. Ethnic minorities (currently do not have their own countries) are: Karaimska, Lemkos, Romanians and Tatars. People representing national and ethnic minorities constitute a few percent of Poland’s population. These individuals are covered by special protection against ethnic and racial discrimination. It is estimated that in Poland there is a Ukrainian minority of over 48 thousand people . It is said that these individuals maintain a distinct cultural or religious affiliation (mainly the Catholic Church of Byzantine-Ukrainian Rite and the Polish Autocephalous Orthodox Church) and communicate with each other in Ukrainian, but are well integrated with Polish society and identify more with Polish society than with Ukraine. Another group are Ukrainians who come to Poland to work or study. Ukrainians and the largest group of foreigners working in Poland – estimates range from several hundred thousand to one million. Approximately 45 thousand people work permanently, others seasonally, often illegaly. 70% of people work physically, usually on construction sites, in renovations, in agriculture and horticulture, and in cleaning and care for the elderly (much like the Poles in the West). Although almost 50 percent of Ukrainians working in Poland have higher education, only about 5 percent work in expert positions. Every 3rd person feels he or she performs tasks below their qualifications. Ukrainians workers are considered reliable, although they usually have to work more and earn less than the Poles on the same positions. More than 30 thousand people from Ukraine study at Polish universities, constituting over half of foreign students in Poland. Ukrainians are the largest group applying for Polish citizenship. According to a study conducted by The Center for Research on Prejudice at the University of Warsaw in 2016, more than 70% Poles aged 16-18 witnessed Internet hate speech against Ukrainians. Almost 80 percent of it concerned the historical past (crimes attributed by the Poles), over 12% concerned their alleged propensity for crime. It is worth knowing that the Ukrainian minority has historical experience of resettlement from 1947 under the codename Operation Vistula. Over 140,000 Ukrainians, Lemkos, Bojki, Dolinian and mixed families, mostly from the Bieszczady and Nizhni Beskids, were expelled to Warmia and Mazury, Pomerania, Lubuskie and Lower Silesia. The Ukrainian population was forced to leave their homes within 2-3 hours. As a result, coupe dozens towns ceased to exist, the cultural heritage of the people and regions were destroyed. In 1990, the Senate of the Republic of Poland condemned this ethnic cleansing as contradictory to fundamental human rights. In 1995, the Polish Prosecutor’s Office declared the Operation Vistula a crime against humanity. To this day, many Polish Ukrainians are confronted with hostility, humiliation, and discrimination. They are attacked verbally, physically, politically and medially – they are sent home (although their home is Poland), religious ceremonies are attacked (in a country where religion and other Christian denominations occupy an important place), memory places are destroyed, which is not appropriately addressed of the state and church authorities.